Yes, Google wants you to keep your bits and bytes as safe as possible through encryption. With the launch of Android 5.0 Lollipop last year, Google wanted to make full disk Encryption mandatory, but unfortunately, the idea did not go too well. However, Google thinks the idea will go right this time, and it will try again to require full-disk encryption by default for devices that release with the newest Android 6.0 Marshmallow and higher versions. 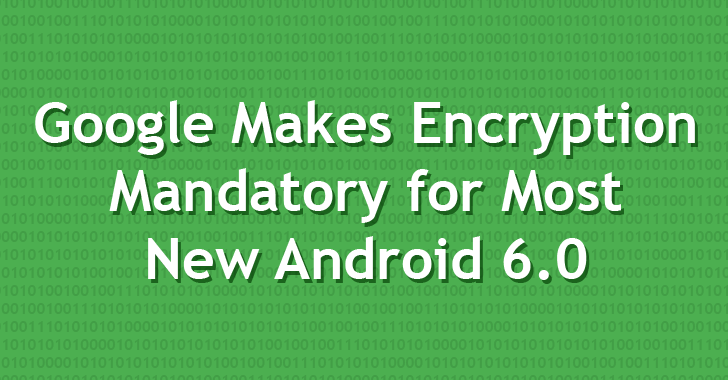 Google has published the new version of the Android Compatibility Definition Document (PDF), mandating Android encryption with a couple of exceptions in Android 6.0 Marshmallow. New smartphones and tablets that ship with Android 6.0 Marshmallow and have certain performance standard must be encrypted by default. Full disk encryption (FDE) is the process of encoding all user's data on an Android device using an encrypted key. Once encrypted, all data on the device is automatically encrypted before ever written to disk. In turn, the data is automatically decrypted before it returns to any calling process that asks for it. All you need is the correct key. Full Disk Encryption is done with a kernel feature that acts directly on the block layer of the storage and has been available in devices since Android 3.0 Honeycomb. However, Android 6.0 Marshmallow brings some pretty big changes and improvements in the overall working of the full disk encryption. In other words, Full Disk Encryption is damned secure, and Google has done a pretty good job by making full disk encryption mandatory on Android devices. What's the Problem with Full Disk Encryption? Last year when Google implemented full disk encryption by default on the Nexus 6 devices, you had probably heard about poor device performance for disk reading and writing. It's true — the problem with full-disk encryption is a hit on the device performance because when you need to encrypt or decrypt on the fly, disk Input/Output speeds suffer. Slower Performance: As mentioned above, Encryption always adds some overhead, which causes your device a bit slower. Encryption is One-Way Only: If you forget the decryption key, you’ll need to factory reset your device that will eventually erase all the data stored on your phone. Do we Really Need Full Disk Encryption By Default? In older devices, there is an option to enable full disk encryption, but by default it is turned OFF. This left us with a choice — Do we need full disk encryption? Many of us will find full disk encryption useful. This helps us to keep secure our sensitive information that we never, ever want to fall into the wrong hands. Full disk encryption also keeps our data secure from snoopers and government agencies who need to see it. But for others, just the standard lock screen security is enough. If they lose their phone, they have Android Device Manager or other utilities to remotely wipe their data. They quickly change their passwords of Google and other accounts, and they even don’t have a reason to fear any consequences if government snoops into their data. So, do you need Full Disk Encryption by Default? Share your views with us; Hit the comments below. Note: This article has been contributed by Naina Agrawal, a computer science graduate, software developer at Tech Mahindra, and an information security enthusiast.